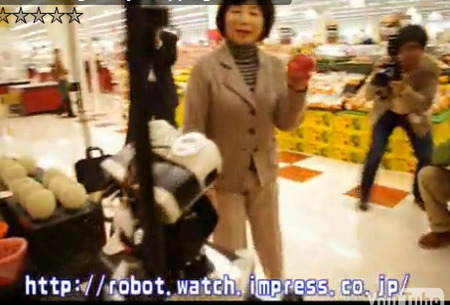 Why carry your shopping yourself when you can get a robot to do it? Okay, they still have trolleys rather than robots in the average British Tescos, but in Japan… they have bag-carrying robots. FTW Japan. The robotic shopping assistant from company ATR is designed to make shopping more convenient and entertaining for the elderly. About the same size as a child, it’s a lot more useful and carries the shopping while you potter about picking up satsumas and suchlike. The Robovie-II android nods its head, says thank you, recommends the apples and make suggestions about salad ingredients. Judging from the video below, it certainly does make shopping more entertaining: the entire shop stops to gawp. The 67-year-old lady in the video below said that she thought it was fun talking to the robot, but a little plaintively that “she felt almost as if she were shopping with her grandchild”. Note to grandchildren: your grandparents still prefer you to robots – go shopping with them more often. I hope these come to Britain.